For the next few days, let’s help some heroes. Thanking wounded veterans for their service is nice but helping them heal is even better. By now, we’ve all heard of the VA’s recent (well… not so recent) failures. No matter where they are, wounded veterans tend to fall through the cracks. They always have. Going back to antiquity, wounded soldiers have never seemed to enjoy the kind of post-war care they deserved. 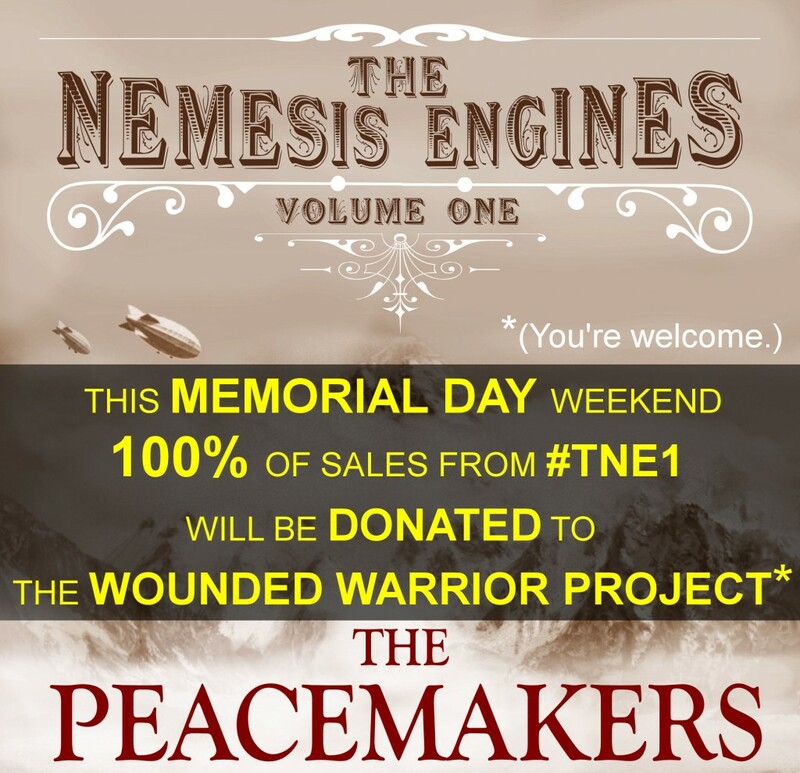 So from now through Memorial Day, I am donating 100% of my royalties from any and all sales of The Peacemakers (Vol.1 of The Nemesis Engines) to The Wounded Warrior Project. If you have read the book already, you know why. If you haven’t yet, you soon will. It’s a small thing, and it won’t fix all of the VA’s failures, but it will help somebody. Even if it only helps one soldier, it’s worth it. So starting right now and through Memorial Day, why not kill two birds with one stone? Score a terrific read (I promise you’re going to love it) and help support a great cause. Help real life heroes get back on their feet. Are you up to it? I hope so. Let’s see how much money we can raise for them in the next few days. So spread the word and share this with your friends (especially those who like to read). If it works, we’ll do it again. Note: if you don’t want to buy the book, that’s cool too. You don’t need to buy anything to help out. You can donate to The Wounded Warrior Project by clicking here. Don’t let the digital format scare you. In case you are new to digital books, you don’t need an Amazon Kindle to download The Peacemakers. The Kindle app is available for pretty much every device and you can download it for free by clicking here. I hope you will join me in this worthwhile little fund-raiser. Have a great weekend and enjoy #TNE1!